The Gitzo GT2541EX Explorer 6X Carbon Fiber Tripod uses advanced 6-layer carbon fiber material for its leg construction. This improved tubing is stronger, lighter, and as resistant as its 12-layer predecessor. Carbon "6X" is manufactured using a complex, 3D process weaving 6 layers of carbon fiber into smooth, solid constructed tubes. It extends to a height of 64.6" and folds down to 21.3" for travel. The Explorer can hold up to 26.5 lb and weighs 4.1 lb. It features individually locking legs that can be fixed at any angle from 0° to 90° and a column that will tilt from the vertical, right over beyond the horizontal and lock solidly at any angle. The Anti Leg Rotation (ALR) system makes it quick and easy to open and close the tripod. Simply turn all of the locking rings at once and the whole leg can be pulled out in seconds. The Explorer is fitted with a column that can tilt from the vertical, beyond the horizontal and lock safely at any angle. The G-Lock mechanism has been completely redesigned in order to achieve a 20% increase in rigidity, faster operation and stronger, safer locking. G-Lock's special design also provides a "gravity lock" effect: the higher the load applied vertically to the leg, the stronger the lock. 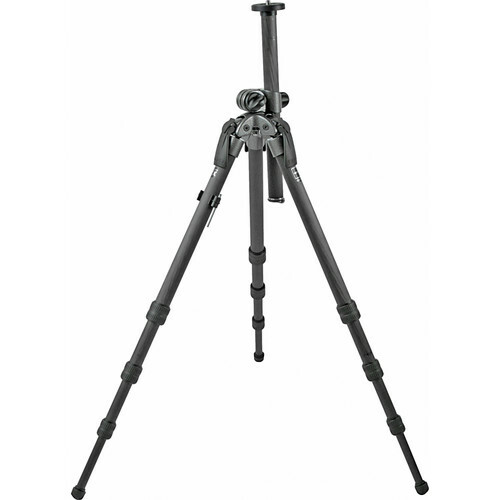 This tripod features completely redesigned upper discs and bolts. The discs, which are composed of aluminum, feature a safe lock material that reduces vibrations and improves head locking. The improved high-grade stainless steel bolt design prevents it from dropping inside the column when adjusted, and makes controlling the tread length stress-free. The redesigned bolts are also corrosion and oxidation resistant. Gitzo was able to develop a six-crossed multilayer carbon fiber 30 percent lighter than the previous 1.5mm generation that features the same exceptional performance of stability and vibration absorption and unbeatable quality. The explorer incorporates individually locking legs that can be fixed at any angle from 0° to 90°. Redesigned built-in, spring-loaded retractable hook on the bottom of the center column provides a place to hang a stabilizing counterweight such as camera, sand or water bags. Grooved rapid center column for improved stability. Box Dimensions (LxWxH) 31.5 x 5.25 x 5.25"
GT2541EX Series 2 Explorer 6X Carbon Fiber Tripod is rated 4.7 out of 5 by 38. Rated 5 out of 5 by Max from Fantastic with Common Sense Approach The GT2541EX 6X Carbon Fiber Tripod Legs legs with the off center post is almost a must for macro/micro photography. I match these leggs with the off center head - any position/angle is possible. Common Sense, when extending the center post out past the legs center of gravity with a heavy lens camera combo, the results will be obvious. The center post comes with a counter balance ring but I just position the leg to a point that offers the most support. When used with reason this tripod system offers exceptional support, stability and possibilities at any height or angle. Everything feels tight and secure when working with the legs. Rated 5 out of 5 by Anonymous from Best Macro/Bad Terrain Tripod If you need to get your camera into awkward positions or in difficult situations, this is your tripod. It doesn't set up as quickly as other Gitzo's I've used, but that's because it's a bit more flexible. It's also just a bit heavier because of the assembly at the top (that provides some of that flexibility). If you primarily shoot on level surfaces and don't need to get into odd positions, get the simpler models (GT2541/2531) that are less expensive and probably better suited for you. Construction quality is, of course, superb. Rated 5 out of 5 by Stephen D. from An excellent tripod for that crazy angle I wanted a tripod that could get me low to the ground, was quick and easy to set up, lightweight yet sturdy. The Gitzo Traveller meets all those requirements. The adjustable center column is very easy to adjust, fantastic for macro and close up work. I had a Manfrotto tripod with clip lock legs so was a bit apprehensive about the Explorers twist lock, found them to be a little bit slower but it did not take long to get used to them. I use it with my Canon 100-400 L with no problems but would not be suitable for heaver lenses. The build quality is excellent and the price reflects that. I am learning the wisdom of buying the best you can afford, it works out cheaper in the long run. Rated 4 out of 5 by Isabell Photography, LLC from My first and hopefully last great tripod Using only premium Canon L lenses, I never had much use for tripods until I recently dove into long exposure shooting and my $ Targus just wasn't giving me the support I needed. So after numerous calls to camera shops and posting after posting on online newsgroups, as well as my own research, I settled on the GT2541EX carbon fiber tripod, as well as the GH2750QR magnesium ballhead. WOW is all I can utter at the moment. When you lock it, it's locked. When you let it go, it remains where you left it. The ballhead alone is 2nd only to sliced bread. All in all, this is one fantastic tripod. I give it 4 stars rather than five for one reason, there is no 4 3/4 star option. I subtract 1/4 star because it took less than a week for one of the screw-in rubber feet to come unscrewed and disappear while on assignment, and though covered by a lifetime warranty, the Gitzo company tells me that they're currently out of stock and that it will be a few weeks. I feel that perhaps the company that makes/sells a $ tripod and $ head should keep a few extra parts sitting around, but oh well...I'll wait and still be the owner of a tremendously well made tripod. Rated 5 out of 5 by Juan Eugui from Great tripod I've been using a Manfrotto 055 Carbon fiber tripod for a few years, and I saw a fellow photographer using the Gitzo explorer an I was amazed for it's versatility. So I decided to get one for myself and it didn't disappoint me. You can place any leg on any angle to adjust it to any topography. The central column can also be placed on any position and it has proved to be useful, it is sturdy, and strong. Great for landscapes, macro photography, night photography, you name it. It is not cheap but worths every cent. Rated 5 out of 5 by Kenneth from Easily worth the price This is the most flexible, yet sturdy, tripod that I've found. I shoot images down near water level in the large rocks along the coast (away from the beaches). Due to the flexibility of this tripod, I am able to adjust the legs in a way that locks the tripod in place in the rocks. Even large waves that crash through the rocks are unable to shake the camera on this thing. My previous traditional tripods couldn't do that, at least not as consistently and easily. The construction is excellent. The weight is light and the tripod collapses down small enough to fit in my checked luggage for flights. I would buy these legs again in a second. Due to the complaints about the off-center Gitzo ballheads, I decided to pair this up with an Acratech GP-s ballhead. The pair does an excellent job of holding my kit securely and steadily in all scenarios tested. Rated 4 out of 5 by George from Tough Light, tough, good at absorbing vibration. This is an improvement over its predecessor, which had a center column that could not pivot, and which therefore prevented placing the camera very close to the ground. Mine recently traveled along the Colorado River on a 6 day raft trip, and it went through water, it went through a sandstorm, it was banged and dropped. At home, I disassembled it and washed it with a garden hose, dried it out, and it's good as new (though it doesn't look new any longer). Can't ask for much more. If you are tall, be sure that you choose a tripod that will be tall enough so you can use the viewfinder without bending down, and without having to extend the center column because that introduces instability and you'll be a little more vulnerable to vibration. That's my only complaint with this ... I always wish it had a little more height (I'm 6' 2). What is the top plate diameter? I am considering it for use with my Kirk BH-3 ball head. Thanks! Mine is 2.25 inches. I have an Acratech head on mine and works just fine. Has anyone used this tripod with RRS Ballhead? Which one is suitable with the GT2541EX? The RRS BH-40 or BH-55. I've been perfectly happy with it. I owned this model's predecessor as well and have been using one or the other version of this tripod for 12 or 13 years now. It's light and stable--as long as you don't overload it. That last part--the concern about instability with a heavy payload--would be my only caveat to recommending it (otherwise) unconditionally. I have a Kirk BH-3 ballhead; I use the tripod with a Nikon 8xx series camera and my heaviest lens is the 80-400 G, so I'm never putting more than about 7 lbs. on the tripod. If I was regularly hauling a payload of, say, more than double that, I would probably look for an alternative. I know that the tripod is allegedly rated being handle more than double that weight, but in my experience I don't like to go beyond roughly half of the official capacity.